In my review of The Infidels, I covered the “aim” of Agonist — selling expensive, limited edition bottles with perfume inside. Even though pricy, glass/crystal bottles don’t tempt me, I still wanted to try Liquid Crystal — Agonist’s fourth perfume/bottle release. Liquid Crystal was created by Fabrice Pellegrin (perfumer) and Åsa Jungnelius (Kosta Boda glass artist). Liquid Crystal includes notes of bergamot, artemisia, spices, cloves, orange, lavender, incense, patchouli, vetiver, white amber, tonka bean, labdanum and cedar. Liquid Crystal opens smooth, with lush notes of orange, bergamot, lavender and some almost-smoky wormwood. The combined opening notes produce, believe it or not, a rich, ripe mango aroma. Slowly, lavender leaf comes to the fore; this is lavender with a hint of menthol-clove and delicious vanilla — a beautiful combination. Liquid Crystal’s amber-y base notes are sheer: slightly powdery labdanum-frankincense mixed with patchouli and “candied” tonka bean. Liquid Crystal's lavender note never disappears; it provides a touch of herbal greenness even during the fragrance's extreme dry down, when cedar, musk and more tonka bean/vanilla appear. Liquid Crystal is a well-made, lovely fragrance that reminds me of classic Shalimar and Jicky; it’s suitable for men or women and has “calm” sillage and good lasting power. Only 300 bottles of Liquid Crystal were made for sale; each bottle (refillable) contains 50 ml of Eau de Parfum and sells for — sit down — $1,150 (a price that makes Agonist The Infidels, at $495, seem downright inexpensive). 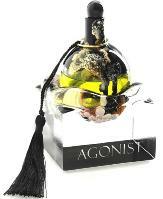 Agonist treats fragrance like a “gift with purchase” — buy an expensive bottle and get some perfume too. After smelling Liquid Crystal, I’ve come to the conclusion that since I don’t collect glass, it’s silly for me to search out samples of Agonist fragrances that I’ll never be able to buy…even when I want to buy them! Agonist Liquid Crystal is available at Luckyscent. Sounds like something I would like to smell but at that price I think maybe I never will. I also do not need that bottle! I would be interested to see how the tonka plays out though, as it is something that can be a bit ick on my skin/to my nose. Cinnamonster: the tonka is very vanillic…not with musky-leather undertones. Blegh. You had me fascinated right up until the bit about the mango. Not that I’d want a perfume more than a car and a mortgage payment combined…er, excuse me, a bottle that’s more than a car and a mortgage payment combined, that also happens to have some perfume in it. But the list of notes sounded so nice until…combine to smell like mango. Dee: … and the beautiful GREEN color is not glass…but the fragrance. The Infidels didn’t appeal to me at all….it was a lot of samples ago but it seems it was a patchouli bath….and everyone knows I hate a patchouli bath….throw some cumin in and I’m pretty much running from the room. So I approached Liquid Crystal with a jaundiced eye..er, nostril. I was stunned by how much I liked it! It’s very herbal, almost medicine-y …but that candied note keeps it from being just a green, herbal thing…it makes it very interesting! I get the bergamot, orange, lavender (but not the bad-breathy lavender of Jicky—sorry, don’t get the Jicky connection , thank goodness since Jicky is AWFUL to my nose) clove and just a smidge of patchouli….there’s something with a little heat that seems to push up thru that herb/candy note….hmm…it’s hard to keep my nose off my wrist when I’ve got a dab of LC going on. I didn’t think it gave off much sillage…but the longevity was nearly extraordinary! One spritz and you’ll be hoovering your hand all day! But $1150 ? LOL —not a glass collector so I really can’t see it. The Approaching Jaundiced Nostril of Daisy the Enabler…I think that should be the title of your memoir! with a title like that, how could it NOT be a best seller??? Actually , it sounds like a near-futuristic , sci-fi , disaster movie title ….along the lines of “Asteroids!” or “Armegeddon”…..imagine a nostril the size of a small planet hurtling thru space toward the earth! maybe hundreds of them….we’ll all be destroyed!! ….wait….how can rogue space nostrils be “hurtling” in “formation”? They’re not just natural rock/nostril meteor formations—those are invading spacecraft from the planet Nostramedes in the outer quadrant! …yeah, I feel a bad B-movie coming on…. we’ll need the governments of the world to work together (see it’s really a story about hope for the future of mankind) to create enormous Nasonex Cannons to repel …. ok, nevermind. Daisy, do you have your own blog? I am really starting to want to read it! Like you, I was completely horrified with the Infidels. Especially the opening, it just seemed SO ridiculously urinous to me. But, alas, I went back to my samples a couple times and now I really enjoy the scent a half hour in. Although, not $495 enjoy. Can’t the refills be purchased at a reasonable price though? Daisy: I liked The Infidels and this one so much I refuse to try any more of them…there are a zillion more approachable, and buyable, perfumes out there. 100% agreement on that point, Kevin! I have a sample of this and was not smitten at first sniff, anyway – fortunately. I’m always SO grateful for the expensive scents I DON’T love, LOL. nozknoz: thankfully, there’s NO scent I need to survive! HA! I think I’d buy the bottle at a garage sale for $10 if it were empty. The ‘fume sounds dreadful. Hi everyone… Im a new poster wanting to access some retail knowledge. Im trying to find a refill bottle of Agonist Liquid Crystal. I know Luckyscent stock this but they have been out of it for a while. Im from Australia and would love to hear from someone! !